Any thought of rain was pushed firmly from our minds as the 2014 night race got underway without any weather problems. Two drivers failed to get through the formation lap without problem, and there were a couple of significant retirements that affected how the race unfolded. Tyre strategy was important, particularly as the race neared its conclusion - the event turned into a tense waiting game to see who would end up where when everything panned out. If you missed any of the action, or want a brief reminder of how things unfolded, then the lap by lap replay from the Factbyte Factbox is just what you need. It's Singapore Grand Prix day! Are you ready and waiting? I am. Just half an hour to go until lights out. Well, the start lights not the big lights. Cos it's dark out there, you know. Moon! Oof, the excitement. We have Lewis Hamilton on pole position, with Mercedes locking out the front row as per usual. Behind them, the Red Bull drivers, with Ferrari disappointingly further back having shown much better pace this weekend. As there's just 30 minutes left, the pit lane is open and the drivers are making their way to the grid. It wasn't all joy yesterday, particularly for the Lotus team. Romain Grosjean was exceedingly vocal about the "bloody engine" in their car. That would be the Renault then. Frustrations setting in, as he starts 16th, with Pastor Maldonado down in 18th. It was super close at the front, with Hamilton pipping his teammate to pole position by just seven thousandths of a second. When told about it, Rosberg shouted "Damn it." Getting very vocal, these drivers. It must be the heat. Of course, they have to find something to talk about over the radio. The FIA's clampdown on what is and isn't allowed to be transmitted has caught out a couple of people, is very confusing for fans and leaves the commentators trying to figure out who'll be in trouble. So far, no one. But we have heard a Force India voice say "Sector time... oop, no, not allowed." Kimi Räikkönen looked on for a strong qualifying result yesterday, but his Ferrari lost power partway through the final top ten shootout. It was a software glitch that caused the problem and should be fixed for today. The power units are definitely something to be aware of this weekend, though. Singapore is very hard on the cars and drivers alike. Hot, humid, and such a long race as well. We've seen brake fires, as well as cars leaping over the kerbs, and a couple of people in the barriers (hint: Pastor Maldonado). Nico Rosberg has been out for a practice start, but returned to the pit lane and has been pushed back into the garage. Frantic mechanics fiddling with the car now. Five minutes left before the pit lane closes, if he's not out in that time, he'll have to start from the pit lane. Rosberg does leave the garage and heads to the end of the pit lane. A steering wheel change occurred, and there's talk of a gearbox/electronic issue. Niki Lauda asks a passing mechanic what the problem with Nico's car was: "We've just changed the steering wheel in the garage, and we're still looking at the data." Sebastian Vettel, coy on the grid but eventually opening up a little: "It’s a long race, 61 laps, it’s a tough race as well here. We’ll wait and see what we can do. Hope for a good start and go from there. Ideally we have a magic start, pass both of them [the Mercedes], and they accept that I’m leading the race." Soft and supersoft compounds on offer today. The gap between the two is considered to be quite big, and they're expecting a three stop strategy to be the ideal. Jenson Button, with his ice pack waistcoat firmly on: "It’s tailor-made for the person who’s starting on pole and that’s not me. It’s just humid, unforgiving, it’s non-stop, there’s no rest around here. It’s tough." The Mercedes crew are still swarming around Nico Rosberg's car. An FIA delegate is watching on with eagle eyes, and a clipboard, to make sure no parc fermé rules are broken. Kevin Magnussen preps for the race ahead, bit of a beard going on there. "It’s very hot, it’s going to be a long race. This race lasts nearly two hours. You can’t prepare in the simulator, it’s the same for everyone, it should be alright." Toto Wolff confirms an electronical problem, first spotted on the steering wheel. They've tried a second steering wheel, and aren't sure what's going on. There's some frantic rewiring going on around Daniil Kvyat's car too, as the Toro Rosso driver has a small issue with his drinks system. That's definitely a requirement for this race! Team radio to Nico Rosberg: "Obviously intermittent fault. If you have control of it, pull away manually. If you don't, we'll have to start from the pit lane." The tyre blankets come off the cars, and the mechanics clear the grid ready for the formation lap to begin. The rear lights flashing on the grid make for a pretty sight, as Lewis Hamilton leads the field away. Nico Rosberg does get left behind, as he hurriedly presses buttons on the steering wheel. Nothing doing, and the Mercedes crew rush in to rescue him. Mercedes push Rosberg's car through a gap in the pit wall, hoping to get started from the pit lane. They're worrying about starts and pit stops now. Kamui Kobayashi has pulled off track during the formation lap, he's climbing out of the car in the run off area. It's a long old lap but Hamilton finally pulls around the final corner and lines up on the front row - with no one alongside him. Every single driver is on the supersoft tyres. Ricciardo surges forward to challenge Vettel and the pair are side by side into the first corner. Fernando Alonso missed the first corner by a mile, ran all the way over the run off and joined in second, but he can't possibly be allowed to keep all those positions. Vettel passes Alonso to move back into second. The two McLarens run side by side and narrowly avoid crashing into each other. Valtteri Bottas is waiting behind them for any opportunity. Team radio from Nico Hülkenberg: "I think I had some contact on the front, check the front wing." Nico Rosberg did manage to get started from the pit lane, and he's currently running in last place. Team radio to Nico Rosberg: "The only thing that's working on your dash is the gear shift paddles." Incident involving Fernando Alonso under investigation - track limits. No further action. Sergio Pérez is also requesting a check on front wing damage. That's both Force India drivers worried about damage on the car. Rosberg is still last, with Max Chilton right in front of him. There's just about eight tenths between them, but the Mercedes doesn't seem to be flying as much as normal. Turn 7 incident involving Kevin Magnussen under investigation - track limits. Lewis Hamilton is leading from Sebastian Vettel, but not scampering away as you might expect. Just under two seconds between the pair. Fernando Alonso sits in third, with Daniel Ricciardo chasing the Ferrari now. Daniel Ricciardo has been told his rear brakes are hot, whilst Hamilton out front is keeping an eye on the temperature of his front brakes. Kvyat is told he needs to attack Magnussen for that ninth place. Vergne is, in turn, told that his teammate will get just two laps to attempt the move. There's no OR ELSE, but it's implied. Turn 7 incident involving Kevin Magnussen - no further action warranted. Jules Bianchi is also informed his front brakes are really getting hot. We're only seven laps in and the temperatures are already an issue up and down the field. Vergne gets ahead of his teammate, after saying: "What are we waiting for?" He's in tenth place. Rosberg is struggling with his gearbox, he's managed to dispatch Chilton, and is now chasing Ericsson for 18th place. Adrian Sutil comes in for his first pit stop. The super soft tyres not lasting too long, just nine laps for the window to open. He takes on more red striped tyres. Hamilton has extended his lead to just over four seconds from Vettel now. He's taking it easy out front at the moment. Nico Hülkenberg pits from 13th, rejoining down in 20th position. Rosberg's told that his pit lane limiter isn't going to work, so he'll have to go down to first gear and stick below a particular rev range. Really tough drive for the German. Felipe Massa comes in for his first stop of the day. A really smooth tyre swap from the team. Räikkönen and Bottas come in at the same time for their stops, as we catch sight of the Mercedes mechanics furiously discussing what to do about Nico Rosberg and his stop. Those that have pitted so far are opting to stick with the supersoft tyres, except for Daniil Kvyat, who has taken on the yellow sidewalled softs. Team radio to Nico Rosberg: "We'll be changing steering wheel, and we'll drop you off the jacks because the clutch won't work." Sebastian Vettel dives left into the pit lane from second place. Fernando Alonso follows in, and the Red Bull crew do a double stint as Daniel Ricciardo comes in as well. Impressive time from the Ferrari crew, almost an entire second faster than Vettel's stop. Lewis Hamilton gets the call to "box, box" and in he comes. Vettel told he's not going to undercut Hamilton, not with that slow stop, I suppose. He's told to stand down and save fuel. Turn 12 incident involving Jean-Éric Vergne under investigation - track limits. Kevin Magnussen has also taken on the soft tyres, with just two now on the yellow striped rubber. Felipe Massa takes the inside line against Sergio Pérez, with Kimi Räikkönen also following through. 6th and 7th for the Williams and Ferrari now. Nico Rosberg finally takes his pit stop, crawling to a halt in the box. The engine goes quiet as the crew do their business, but he can't get it going again. Rosberg waves his hands to say nothing is happening, it's over. He's clearly ranting on the team radio there. Bottas also manages to get past Sergio Pérez, as the Force India driver loses three places in as many laps. Rosberg's out of the car, watching the screens, looking totally fed up. Toto Wolff puts a consoling arm around the driver, with a bit of a pep talk, but it's not going to help yet. 5 second stop/go penalty for Jean-Éric Vergne - track limits and gaining an advantage. Everyone has pitted once now except for Max Chilton, who is in 17th place. Replays of Esteban Gutiérrez's stop show that he had a slow stop as one of the tyres wasn't attached properly. Good job from the team to catch it and fix it before he went sailing off and picked up a hefty penalty. The fuel used graphic shows Hamilton leading comfortably with much lower consumption than the rest of the top ten. Only Massa is close, and still 0.25kg away. Tweet from @pirellisport: P. Hembery: "Initial deg bit higher than anticipated, so first stops a couple of laps earlier than predicted. Still expecting 3 stopper"
Esteban Gutiérrez has retired, climbing out of the car in the garage and throwing his gloves down in a proper rage! He storms out the back of the garage. Team radio to Max Chilton: "In now, Max, we have a front right puncture." The Marussia does head straight into the pit lane for a quick change of tyres. He'd only just taken his first stop, so that will have wrecked Plan A. The first seven drivers are all on the supersofts, with Jenson Button the first runner on softs in eighth. He asks how many laps others are doing, as strategies start to evolve. Vettel is told to "ignore the beeps" as the Red Bull driver starts to see Fernando Alonso catching him quickly. 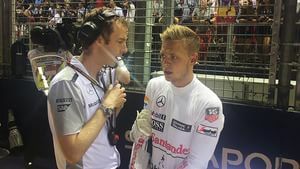 Hülkenberg, in 11th, is instructed he needs to get closer to Vergne and Magnussen in front of him, so he can jump them in the pit stops. That seems like an ambitious target. Felipe Massa is the first driver to come in for their second stop, followed quickly by Romain Grosjean. Another superb stop from the Williams team, 2.4 seconds for Massa, and the soft tyres go on the car. Replays show Kevin Magnussen running wide at the first corner, just like Alonso did at the race start. 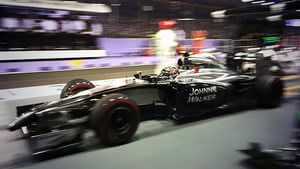 Ted News: Gutiérrez was so annoyed because he was running in 13th place and felt the car was good beneath him, so he could have been in line for points. But the battery wasn't charging, and it all fell apart from there. Valtteri Bottas pits for another good Williams stop. He rejoins behind Max Chilton and follows the Marussia for a few too many corners, before finally getting past the backmarker. Pastor Maldonado's pit stop went slightly awry at the end, as he pulled away with the front left wheel gun still attached to the wheel. Felipe Massa moves into eighth place after passing Nico Hülkenberg, who has yet to come in for his second stop. Sebastian Vettel pits from second with the soft tyres on. Fernando Alonso has already pitted for the supersofts instead. Alonso sweeps ahead as the Red Bull driver exits the pit lane, but they're now on opposite compounds. Nico Rosberg: "It was a horrible feeling to see everyone go, because I knew it was over. The whole steering wheel wasn’t working, I didn’t have any hybrid power. I would shift two gears at a time, no DRS. The car just wasn’t working at all. There was no point to continue. Tough day really. "I'm disappointed with today, reliability again. It's a weakness we have in the team and we must improve it. Try to understand what happened today, move on, and then full attack for Suzuka." Hamilton has pitted, putting Daniel Ricciardo into the lead of the race for now. It was quite a slow stop for the Mercedes team, almost double what some of the others have been. Replays show the mechanics were cleaning something off the front wing slots, which was why Hamilton had a 4+ second stop. Ricciardo pits from the lead, rejoining in fourth place directly behind teammate Vettel. The gap between Alonso and Hamilton is just four seconds, with Hamilton wary of the driver behind him. Alonso sets the fastest lap of the race so far as he begins the chase. Hamilton responds with a 1:51.793. Kevin Magnussen is head on the radio saying something is burning, possibly his seat. Ouch! As if it wasn't hot enough out there. Tweet from @clubforce: The Hulk seems to enjoy his new set of tyres - he just got his personal best of the day as he continues in P11. Pérez and Grosjean are almost side by side as they battle for 12th place. Kvyat is also biding his time behind the two. Daniel Ricciardo reports a loss of power and potential gearbox problems as well. Grosjean complains that it wasn't a fair move from Pérez, but it looks like the Force India driver left him room. Sergio pits anyway, abandoning the fight. Tweet from @pirellisport: Vettel strategy looks interesting: aiming to have the best performance at the end of the race, with supersoft and low fuel. Sergio Pérez was making his way around the track when his front wing just dislodged, disappearing under the car. Replays show contact with Adrian Sutil, as the Sauber crushed him into the wall at a precious corner. The wing half hanging off then disappeared under the car, shattering debris everywhere. It's pit stop central as drivers make the most of the safety car period. Alonso, Button, Räikkönen, Grosjean, Maldonado, Bianchi, and Ericsson. Sergio Pérez has been in for a new nose and rejoins way down in 17th place. Nico Rosberg, meanwhile, is watching on from the pit wall. Lewis Hamilton airs his concerns about running over debris, but he hasn't come in for a stop yet. Vergne locks up and takes to that popular shortcut at turn one. It looks like Vergne was busy trying to stay ahead of Kimi Räikkönen, who was exiting the pit lane. But he took to the run off area. He's already got a penalty for exceeding track limits too. The marshals are dashing about trying to pick up all the bigger parts of carbon fibre, but I think they'll need brooms to make a really good job of it. Thermal imaging on Vettel's car show just how cool the tyres have gotten behind the safety car. Tweet from @BadgerGP: RIC's engineer trying to stay within radio limits - "Avoiding kerbs might, um, help the issue you might have?" Team radio to Kevin Magnussen: "Remember to drink." "It's too hot, I can't drink it, it burns my mouth." Lapped cars may now overtake - Jules Bianchi, Sergio Pérez, Marcus Ericsson and Max Chilton. Bottas reports his power steering has gotten sticky, he's only just noticed it and will report if it gets any worse. 5 second stop/go penalty for Adrian Sutil - track limits and gaining an advantage. At this point in the race, the majority of runners are on the soft tyre. Race leader Hamilton is still on the supersofts. Vergne, Magnussen and Kvyat down in 9th to 11th respectively are also on the red stripes, whilst Sutil down in 14th is on the reds too. Only Lewis Hamilton and Jean-Érc Vergne haven't taken on both compounds at this point in the race. Incident involving Sergio Pérez and Adrian Sutil under investigation - causing a collision. No further action warranted. Hamilton leads away as the safety car disappears from the front of the pack. Vettel and Ricciardo follow on behind. Those three have stopped just twice, with Fernando Alonso in fourth having stopped three times. Magnussen takes a look at Vergne in ninth, but has to back off to avoid any contact. Hamilton has put the hammer down and hauled out a four second lead already. He needs to get a move on, though, as he still has to take on the second compound. Team radio to Valterri Bottas: "The only way we're going to make today work now is to get this tyre to the end." Grosjean complains of no grip at the rear of the car, and that there might be a problem on his Lotus. They say there's nothing wrong with it, no puncture, aero data looking good. 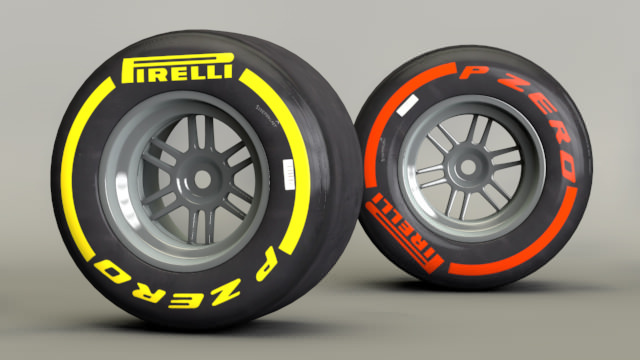 Ricciardo and Massa have also been told they're going to the end of the race on this set of tyres. Hamilton needs to get as big a gap as possible to minimise the pit stop damage. Tweet from @pirellisport: Pit stop time loss here is just under 30 seconds. That's going to be crucial in the race outcome. Hold on…. Adrian Sutil has pitted and doesn't appear to be coming back out again. The Sauber is in the garage, up on blocks, and the German is exiting the vehicle. Meanwhile, Vettel is told he needs to get to the end of the race but the defending champion doesn't think it's possible. "Everyone else is doing it. If you pit, you'll have to overtake too many cars." Max Chilton makes his third stop of the race, and is back in last place. Tweet from @WilliamsRacing: Looks like everyone up front is trying to make it to the end now except HAM. Could make it interesting in the last few laps! 19 to go! Hamilton is told he'll be going for about seven more laps on these tyres, and although he questions the risks associated with the strategy, they ease his fears about another safety car period. "We'll come straight in if that happens." Daniil Kvyat comes in for a third stop, it's not a smooth one (4.3 seconds), and is now down in 17th. "Oh my gosh, without a drink, I'm dying here." He tells his crew but they ask him to remain out there. Vergne and Pérez also come in for third and fourth stops respectively. Team radio from Valtteri Bottas: "Absolutely zero steering feel. Sticky and heavy but I can drive." Hamilton has his lead up to about 20 seconds. Kevin Magnussen pits from 9th place, and rejoins in 14th. Jenson Button is busy chasing Valtteri Bottas, there's half a second between them, with the Williams currently trying to hold on to 6th place. Tweet from @Lotus_F1Team: which means we currently have a point in this race. Which is nice. Ricciardo is holding on to third place, but still has problems with the car, the radio traffic being quietly obtuse as they try to work on a solution. Third and final stop for Magnussen. Sergio Pérez overtakes Daniil Kvyat for 14th place - cut to Franz Tost shaking his head on the Toro Rosso pit wall. Button isn't making any progress on Bottas, wailing over the radio that he's too fast in a straight line. Of course, in reality, Bottas is just slower in the corners due to a lack of power steering. Hamilton complains he needs to come in for fresh rubber soon as his tyres are going off. But he still needs a few more seconds to comfortably pit and retain the lead. And he's in. Lewis Hamilton pits from the lead. It's a 2.9 second stop, clean enough, but Sebastian Vettel sweeps into the lead. Hamilton rejoins in second, just millimetres ahead of Daniel Ricciardo. Meanwhile, in amongst the excitement, Alonso has closed up to Ricciardo, less than a second behind the Red Bull driver now - hunting a podium position. Lots of cheers for Vettel leading the race, but it's not going to be for long. Hamilton is hunting the German down, and he's got fresher tyres on board. The Red Bull mechanics hustle into the pit lane but then walk back in. Hamilton takes the lead, easily done for the Mercedes driver. Yellow flags for Jenson Button, who has pulled off track with a complete power shut down. Onboard replays show his steering wheel just went black, rebooted but nothing doing. He's pulled off track at turn 14, nicely out of the way. The Toro Rosso driver drove round the outside of Pastor Maldonado, all four wheels off the track as he moved into 9th place. It doesn't look like anyone is keen to retrieve Button's car, so we may be under yellow flags until the end of the race. Only five minutes left until the two hour time limit is up. We may not see all the laps completed here. Kevin Magnussen overtakes Pastor Maldonado for tenth place, which drops the Lotus driver out of the points. There's a heck of a battle for sixth place, with Räikkönen half a second down on Bottas, Hülkenberg and Vergne similarly close behind them. 5 second stop/go penalty for Vergne - track limits and gaining an advantage. Will be converted to a post-race time addition. Just about a second separates Vettel, Ricciardo and Alonso. Everyone looking for a podium. Maldonado and Kvyat have both been off track but continue onwards. Tyre degradation critical at this point. Vergne has suddenly picked up the pace, moving past that train of cars behind Bottas. He's up to sixth place now (although will still drop back with +5s). Lewis Hamilton wins the Singapore Grand Prix! 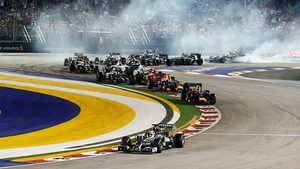 The win helps Lewis move into the lead of the championship, and the happy driver weaves his way down the home straight. Behind, Bottas runs off the tyre grip cliff, dropping back to 11th, and sliding around the track. Vettel and Ricciardo finish in that order to wind up on the podium. Alonso just misses out. Fireworks are currently showering the track with light as the remainder of the drivers cross the line and start their cool down lap. Hamilton waves a peace sign at the crowds as he takes his victory lap. Jean-Éric Vergne did a fantastic job to make his way up to P6 AND claw out an eight second gap to create enough of a buffer for his penalty. The three podium finishers have a good debrief in the green room. Lots of water going on board, and towels required. Vettel and Ricciardo discussing who was pushing hard at the end, and how Hamilton had such fresh tyres to surge ahead. Tweet from @PhilDuncanF1: SV: You mush have been chilling at the end? LH: At that point I was chilling because I had the fresh tyres. National anthems play out as the drivers stand to attention on the podium. Ricciardo gives a big thumbs up to the crowd - plenty of people running down the track to get a good look at the winner and his friends. The champagne sprays, more fireworks flare, and there are some big smiles on the podium. Podium interviews - Lewis Hamilton: "Of course I was dreaming this last night but you never think it will happen. I just want to say a huge thanks to my team. To be arriving here, knowing we have a car we can fight with… I couldn’t do it without them. Thank you guys. "At the time, it was not knowing what the situation was. I knew I had a big gap, but if the safety car came out, what would that mean. I knew I’d have to fight the guys, I knew we’d have a chance to get by, I felt kind of comfortable." Podium interviews - Sebastian Vettel: "It’s a circuit that I really enjoy, the atmosphere’s great. It’s a tough one, it’s two hours, again we went until the full two hours. I had a good start, got past Daniel. I think we had a decent race.. the safety car came in the worst possible moment for us. We tried to stay out with the last set of tyres, which was very borderline. A lot of pressure from Daniel and Fernando behind, but very happy with P2. "It’s quite hot, obviously. The cars are sliding a lot so you have to focus quite hard. It’s definitely a race we enjoy as drivers, because it’s such a good challenge. Standing up here you get a cool bottle of champagne, so that’s nice." Podium interviews - Daniel Ricciardo: "Feels like a home race, Singapore to Perth is pretty much as close as Melbourne to Perth. It’s like another home race. Obviously, Alonso went off, that was clear. I knew he’d give it back to Seb, whether he had to give it back to me or not, I’ll have a look at that. I was just focused on regrouping from the start. To get on the podium is not a bad result, good for the team." Podium interviews - Lewis Hamilton: "I was so excited to have, I was looking for that clean weekend, and now I have. It’s not perfect for the team, obviously Nico didn’t finish… we were looking for that 1-2, I don’t think any team has managed a 1-2 so that’s what we were hoping for. There’s things we can work on." Tweet from @clubforce: 8 points for the team - we go to 117 points, our best ever, and get back into 5th in the Championship! So, it wasn't the best afternoon of racing. The safety car procedure needs yet another rethink, particularly at such a slow track like this one. Things were drawn out, just managing to get tense towards the end of the race. The championship, however, has closed up dramatically. With Lewis back in the lead, and Nico having a bit of a run of bad luck, the psychological battle will continue no question. Hot and humid racing showed that the younger drivers may not be quite as well equipped to race in such conditions as those who have a bit of experience under their belts, but overall everyone did a sterling job. The next race is in Japan, an early start for the European audiences. It's two weeks away, so I hope you'll stay tuned to Sidepodcast in the meantime. And I'll see you back here then!